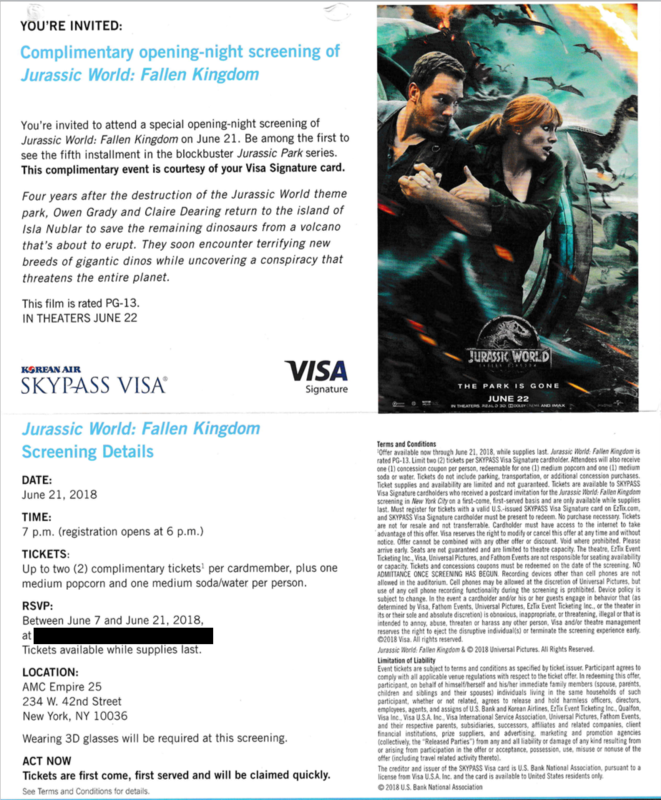 Free screening of Jurassic World sequel from a credit card? Weird. After arriving home from a weekend trip to Toronto, I was greeted by a mailer from my Korean Airlines SkyPass Visa card. It was interesting because I don’t normally get anything from them since I don’t use it ever(I got the card for the special 45k miles bonus). This one, however, had a special invitation to view the upcoming Jurassic Park sequel for free! And in 3D, no less! I love how these companies sometimes do random things for their members. AMEX has its offers section (which can be very lucrative on purchases at chain stores); airlines have shopping portals (also useful); and more. While this doesn’t rival the time I went to do a test drive at a Chevrolet dealership for 7,500 AAdvantage miles, it’s still a good story.